For I have chose to dwell in a place you cannot see. Rumi in his eloquent words suggests us that our 'true self' can never be seen. Our true nature is not meant for our physical eyes, it can only be felt / seen through the eyes of the inner heart. Each human being is such an unique mystery! Because of that uniqueness Rumi says that only to see and understand someone truly we have to put ourselves behind the eyes of 'the one'. Entering into the highly esoteric human field of 'the one' is what enables us to mysteriously become 'you', to become 'the friend', to become a true lover. Its a timeless secret. This powerful portrait of Rumi shared in this post, thanks to artist 'Zed' is unlike any other portrait of Mevlana Rumi that I have seen. 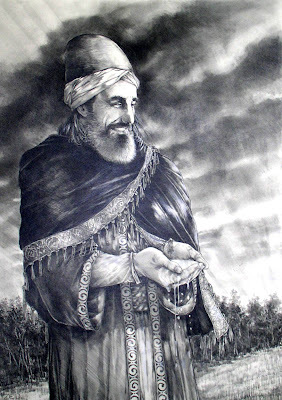 Many have tried representing him before (for comparison the links of other artists' rendering of Rumi is given at the end of this post), but Zed's inspiring work that which 'came' through him holds something special. In all the previous representations of Rumi, he is always an old, somewhat sad looking old person; while he being such a powerful Ashik, Divine Lover, was anything but. Rumi, who possessed a blessed laughing heart can best be portrayed with a laughter of spiritual magnetism which is wonderfully done here. Rumi was the vessel Shams had looked for for a very long time to pour light into. There is a stillness to the piece and a quiet joy of completion about Rumi that needed to be said. No, it DEMANDED to be spoken in a way that satisfied the voice in the artists heart. Its very graceful and healing to see that Rumi is holding water in his hand in this piece. Such a sacred symbol! Indeed his fountain of inspiration is still quenching thirst to so many lovers at heart. To view the portrait in larger version and appreciate in details, click on the image. Our heartfelt appreciation to Zed for sharing this beautiful inspiration with us all. May his heart and brush continue to be blessed and inspired. 3. Painting of Rumi by Setsuko Yoshida based on the oldest extant portrait of Rumi.